Jan Albers studied painting at the famous Kunstakademie Dusseldorf. Early on he sensed that working within the established protocols of paint and canvas felt too restraining. He has gone on to produce a major body of work that shuns the flatness of the picture plane replacing it with a divergent mix of high and low art materials that are bolshy and strident, elegant and considered, yet seldom demure. As much as Albers wished as a student to eschew convention, his work touches lightly on various 20th century moments. One feels echoes of Judd and Chamberlain in their robust materiality and determined “object” status - the visceral impact of Fontana’s puncturing of the picture plane, in his “chain-saw” lacerations. But there are also reverberations in form and composition that recall his namesake Anni Albers’ refined geometries, or Frank Stella’s shaped canvases. As cognizant as he clearly is of history, Albers feels determined to extend his own artistic vocabulary so that it embraces a range of connections to architecture, even the environment, complete with its blend of allure and toxicity. As Stephen Berg has described…“the entire picture is actually a permanent construction site alternating between destruction and repair.” This altercation between making and unmaking, harmony and disharmony runs through all of Albers work. One gets the sense that he views most material as potentially “uncooperative” and unruly – something to be tamed or at the very least bridled. In all of his works you are compelled to look into them rather than at them from a respectful distance – the enticement and persuasion of the poisonous perhaps. Their complex topography, their nooks and crannies, their structural depth and intricacy suggest an entirely different reading of space that isn’t pictorial nor is it truly sculptural. Whatever the case, Albers is certainly up-dating the bas-relief and its traditional viewpoint. The gallery is thrilled to present a range of major works by Jan Albers, including the large and magnificent bronze, mightyhighOnlight and stunning new ceramic works alongside further examples of his diverse and innovative practice. It is also particularly pleasing, that during this years Art Basel Hong Kong, four large scale works were placed in major collections in Taipei and in a private museum collection in Shanghai. The response to his work at Art Basel Hong Kong has been overwhelming. We are delighted to say that Jan will also be present for the opening in Sydney. Maybe it was the garden-like quality of Jan Albers work that first attracted Sean to it. In his recent Henry Hurt vs. Holly Heal series (seen below) the skewed squares seem to have the character of a flower, like gridded petals blowing in the wind. The pieces in the series have a dimensionality that expands as the as the viewing angle changes. As constructions, they're ingeniously engineered. Their texture radiates a kind of kinetic energy, seeming to move before your eyes. Their structure is both flower-like and architectural, like something made by bees in a kaleidoscope. The references to Cubism are hard to deny. The pieces are built from polystyrene (the stuff packing peanuts are made from) and/or wood and then covered in spray paint, or as in the gray piece above, graphite. The exhibition will travel to Kunstpalais Erlangen. 1301PE is open during ALAC. 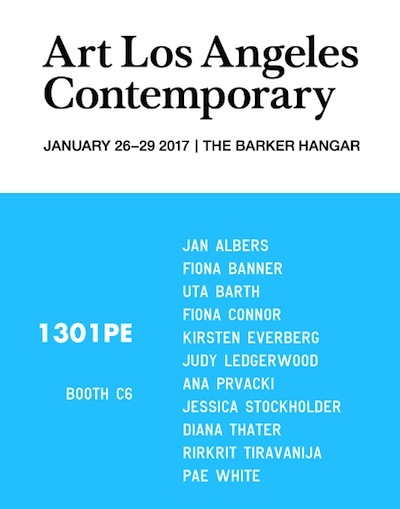 1301PE is pleased to participate in Art Los Angeles Contemporary. We are presenting works by Jan Albers, Fiona Banner, Uta Barth, Kirsten Everberg, Ann Veronica Janssens, Jorge Méndez Blake, Jorge Pardo, Rirkrit Tiravanija, Pae White, and Paul Winstanley.